These are the letters of Captain Cecil Mainprise, who ventured to Lhasa in 1903-4 as part of the Younghusband Expedition. In another example of ‘history-as-it-happens’ (similar sites have been highlighted in past Frog posts) a relative of the captain is posting the letters throughout this year, 105 years later, on the day that they were written. Now that I’ve found him at the Phari Fort today, it’s a journey I plan to follow until they reach Lhasa in August, and beyond. This book of letters remained unread in my father’s book case for many years. I dont think anyone had read them because they were so difficult to decipher and perhaps also because no-one quite realised what an exciting escapade Uncle Cecil had been involved in and what a charismatic and remarkable character Younghusband was. I decided to have a go at reading them after my father died. I would spend evenings reading the letters and dictating what I had learnt into a cassette recorder. This process continued over a period of months. It helped that I had a period of jury service when I could press on. It was a wonderful experience. As if time had doubled back on itself and Cecil was even then on his way to Lahssa. It was a tough journey but in those days they tended to just get on with things. And of course writing to Delia he would not have wanted to worry her. my grandfather was also on the exepedition and I would also like to find out more on his role. Did you have any luck in finding other sources of information?. my grandfather William Stoten was a private on the expedition. He received the Tibet medal but it has become lost over the years. I would like to trace anyone who might have the medal and would like to see his army records and photos ,as he also was at the Delhi Dubar. Has anyone any hints on where to start. His Regiment, the Royal Fusiliers, cannot help. I have a campaign medal from the Younghusband Expediton awarded to one of the Gurkha soliders on the expedition. His name is engraved on the edge. I’m curious as to how many of these medals are out there. Hi Mark St Giles. 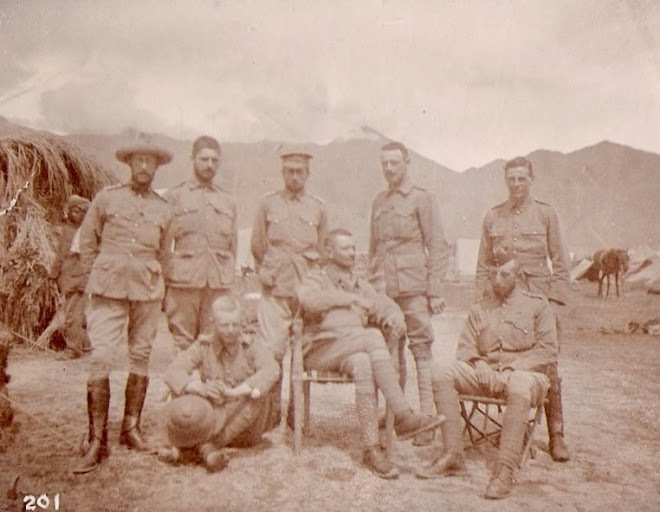 Also along as a reporter from the Daily Mail was Edmund Candler who wrote “The Unveiling of Lhasa.” Peter Fleming’s account of the expedition, “Bayonets to Lhasa” is very in depth and has the added advantage of access to military correspondence and government records that were secret at the time of Landon & Candler. I just retrieved my Younghusband Expedition medal. It was not as I wrote awarded to a Gurkha but to a collie. The inscription reads, “281 Cooly Nidal Singh S & T. Corps.” Any feedback on this? Thank you.